PROLine Products LLC hereby warrants our product line of aluminum trailers for a period of three (3) years from date of purchase for noncommercial use and one (1) year for commercial use. This warranty is non-transferable and is limited to defects in workmanship performed by PROLine Products LLC only. Other components (tires, wheels, axles, brakes, couplers, jacks, lights, actuators, doors, hardware, painted sides, etc.) are covered by OEM (original equipment manufacturer) warranties and must be filed with the OEM. Contact PROLine for OEM contact information. This limited structural warranty is extended only to the original consumer purchaser. Subsequent purchasers and transferees are excluded from coverage under this warranty. 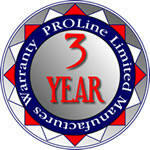 Warranty service must be performed or arranged by PROLine Products LLC. Provisions of this warranty shall not apply to any product which is found to have been modified or altered in anyway; or shall the warranty apply to any defect or malfunction which was caused by damage, unreasonable use, or failure to provide reasonable and necessary maintenance. The warranty will not cover damage caused by overloading the trailer beyond stated capacities, or loss from rust and corrosion. When towing with a heavy duty commercial vehicle such as a dump truck or flatbed rated for 10,000 lb. GVWR or more, an air hitch (www.shockerhitch.com) or similar device should be considered to avoid excessive stress on the trailer. If an air hitch (or similar device) is not used in this scenario the terms of this warranty will be voided. This warranty gives you specific legal rights, and you may also have other rights which vary from state to state. PROLine Products LLC reserves the right to change models or specifications without prior notice.